HOW DO PEOPLE MAKE DECISIONS WHEN TIME IS LIMITED, INFORMATION UNRELIABLE, AND THE FUTURE UNCERTAIN? Based on the work of Nobel laureate Herbert Simon and with the help of colleagues around the world, the Adaptive Behavior and Cognition (ABC) Group at the Max Planck Institute for Human Development in Berlin has developed a research program on simple heuristics, also known as fast and frugal heuristics. In the social sciences, heuristics have been believed to be generally inferior to complex methods for inference, or even irrational. Although this may be true in “small worlds” where everything is known for certain, we show that in the actual world in which we live, full of uncertainties and surprises, heuristics are indispensable and often more accurate than complex methods. Contrary to a deeply entrenched belief, complex problems do not necessitate complex computations. Less can be more. Simple heuristics exploit the information structure of the environment, and thus embody ecological rather than logical rationality. Simon (1999) applauded this new program as a “revolution in cognitive science, striking a great blow for sanity in the approach to human rationality.” By providing a fresh look at how the mind works as well as the nature of rationality, the simple heuristics program has stimulated a large body of research, led to fascinating applications in diverse fields from law to medicine to business to sports, and instigated controversial debates in psychology, philosophy, and economics. In a single volume, the present reader compiles key articles that have been published in journals across many disciplines. These articles present theory, real-world applications, and a sample of the large number of existing experimental studies that provide evidence for people’s adaptive use of heuristics. 1. Homo heuristicus: Why Biased Minds Make Better Inferences. 2. Reasoning the Fast and Frugal Way: Models of Bounded Rationality. 3. Models of Ecological Rationality: The Recognition Heuristic. 4. How Forgetting Aids Heuristic Inference. 5. Simple Heuristics and Rules of Thumb: Where Psychologists and Behavioral Biologists Might Meet. 6. Naive and Yet Enlightened: From Natural Frequencies to Fast and Frugal Decision Trees. 7. The Priority Heuristic: Making Choices without Trade-Offs. 8. One-Reason Decision making: Modeling Violations of Expected Utility Theory. 10. Hindsight Bias: A By-Product of Knowledge Updating? 11. SSL: A Theory of How People Learn to Select Strategies. 12. Fast, Frugal, and Fit: Simple Heuristics for Paired Comparison. 13. Heuristic and Linear Models of Judgment: Matching Rules and Environments. 14. Categorization with Limited Resources: A Family of Simple Heuristics. 15. A Signal Detection Analysis of the Recognition Heuristic. 16. The Relative Success of Recognition-Based Iinference in Multichoice Decisions. 17. The Quest for Take-the-Best. 19. A Response-Time Approach to Comparing Generalized Rational and Take-the-Best Models of Decision Making. 20. Sequential Processing of Cues in Memory-Based Multi-Attribute Decisions. 21. Does Imitation Benefit Cue-OrderLlearning? 22. The Aging Decision Maker: Cognitive Aging and the Adaptive Selection of Decision Strategies. 23. On the Psychology of the Recognition Heuristic: Retrieval Primacy as a Key Determinant of its Use. 24. The Recognition Heuristic in Memory-Based Inference: Is Recognition a Non-Compensatory Cue? 25. Why You Think Milan is Larger than Modena: Neural Correlates of the Recognition Heuristic. 26. Fluency Heuristic: A Model of How the Mind Exploits a By-Product of Information Retrieval. 27. The Use of Recognition in Group Decision Making. 28. Psychological Models of Professional Decision Making. 29. Geographic Profiling: The Fast, Frugal, and Accurate Way. 30. Take-the-Best in Expert-Novice Decision Strategies for Residential Burglary. 31. Predicting Wimbledon Tennis Results 2005 by Mere Player Name Recognition. 32. Heuristics in Sports That Help Ws Win. 33. How Dogs Navigate to Catch Frisbees. 34. Optimal versus Naïve Diversification: How Inefficient is the 1/N Portfolio Strategy? 35. Parental Investment: How an Equity Motive Can Produce Inequality. 37. Green Defaults: Information Presentation and Pro-Environmental Behavior. 38. “If …”: Satisficing Algorithms for Mapping Conditional Statements onto Social Domains. 40. Aggregate Age-at-Marriage Patterns from Individual Mate-Search Heuristics. Pity it hasn’t been released on amazon UK yet! 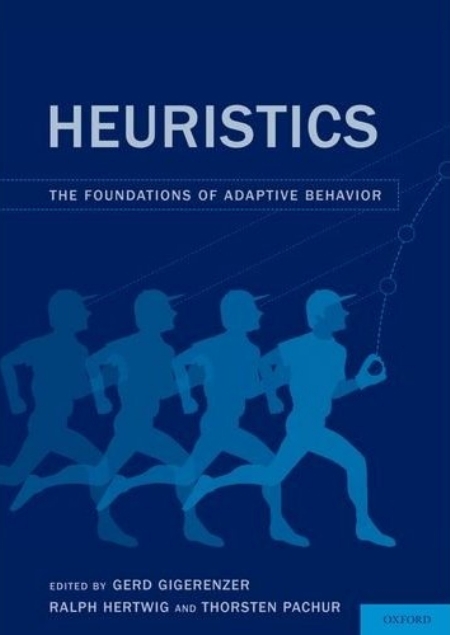 Heuristics: The foundations of adaptive behavior was written on May 25, 2011 and filed in Books,Ideas,Research News.